One of the four members of the lynx genus, the Canadian Lynx is an inhabitant mainly of Canada and Alaska, with some individuals recorded in certain parts of northern United States. A resident largely of snowy mountainous areas, it is adapted physically to survive in cold weathers. Though smaller than the Eurasian Lynx, the Canadian Lynx is a formidable predator with a size twice as big as the domestic cat. Males are larger, with an average weight of twenty five pounds and length nearing three feet. A beautiful cat, the coat of the Canadian Lynx is thick and silvery brown with darkish markings that are often hard to spot in the dense fur. Neck is covered with a thick ruff of hair and ears, as with other lynx species, are tipped by long hair tufts. Tail is short like that of the Bobcat, though it is completely black - unlike that of the Bobcat whose tail is black on the upper and white on the lower surface. Hind legs are longer and paws are broad, aiding the cat to walk on snow. 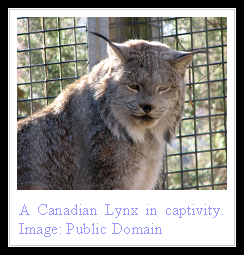 A secretive and largely solitary feline, the Canadian Lynx is a diurnal hunter. 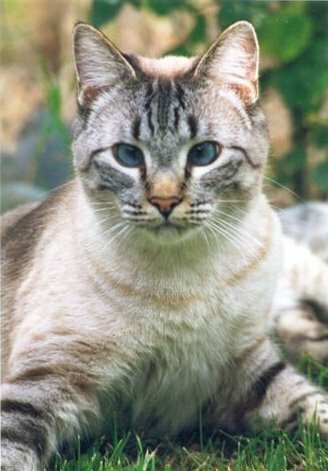 A specialized predator in large parts of its range - the cat preys mostly on the snowshoe hare. In fact its population corresponds directly to the rise and fall of the hare population in its range. Other mid-sized animals are also taken including birds, small ungulates and rodents and scavenging is often observed in winter on left over deer and caribou carcasses. Average lifespan of this cat is around fifteen years. After a gestation period of two months, mother gives birth to up to eight kittens - the number correlating to the abundance of prey animals at that point in time. The young stay with the mother until they can fend for themselves. Sexual maturity is reached at nearly two years. The lynx is easily trapped and mainly hunted for its fur. It also suffers indirectly at the hand of hunters since its main prey animal - the rabbit - is widely killed for sport. Though not critically endangered yet, the loss of prey and habitat has led to the decline of the beautiful cat in many parts of its former range. Such nice looking cats! Too bad people want to hunt them. There is no reason to. They do not need the pelts for warmth anymore. Hunting is stupid! I totally agree with Mickey. It is to bad that people don't get that these are living sentient beings and that if there is another way to keep warm, they should. This is quite the handsome cat. The fur sounds to be very pretty. He/she looks like it's tongue is sticking out at you. Also agree with the hunting bit. The lynx posted earlier is a handsome one also. I agree with Mickey too.why hunt these creatures I mean what did they ever do to you?I love these animals! I agree also! People are just SOOOOOOOOOOOOOOOOOO greedy they dont care if they kill an animal! They figure ohh theirs lots, just killing 1 wont hurt! Its soooooooooo sad!!!!!!!!!!!!!!!!!! Do not kill lynx they are endangered aren't they??? and their awesome animals! People are killing them for their fur? Jeez! Can't people lay off the hunting!? You need facts about body stength!!!!!!!!!! They have 1-4 babies not up to 8!!! Case Study Solution Case Study Help, Case Study Solution & Analysis & This case study requires the focus of the audience in order to make sure it is properly connected with the objective being presented. We can be called your problem solvers; buy economics essay every academic problem that you come across. I read your blog thanks for inform us about your member. papers for students to help them in accomplishing their goals. Great Information,it has lot for stuff which is informative.I will Online Programming Project Help share the post with my friends. This is great information for students. This article is very helpful Do My Solidworks Assignment i really like this blog thanks. I also have some information relevant for online dissertation help. I personally like your post; you have shared good insights and experiences. Programming SPSS Keep it up. John arnold is an academic writer of the Dissertation-Guidance. Who Stats Assignment Help writes quality academic papers for students to help them in accomplishing their goals. Such a nice post, Social Media Advertising Agency keep providing good resources. I personally like your post, Online Exam Help you have shared good article. It will help me in great deal.